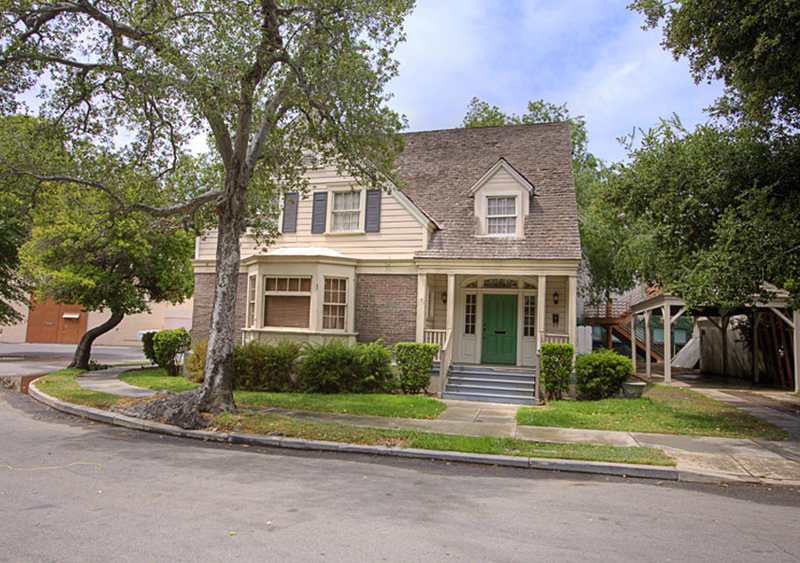 On Wednesday, August 28, Turner Classic Movies will be playing films starring actress Shirley Jones as part of their Summer Under the Stars series. 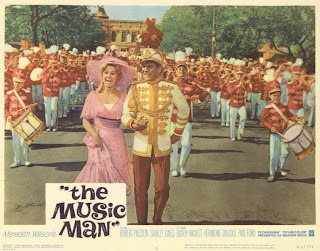 One of my personal favorites, The Music Man (1962), will be showing at 8:00 PM EST. I grew up with this film. My mom loved musicals, so films like The Music Man, Seven Brides for Seven Brothers and The Sound of Music were regularly being played on the VHS player. Certain images from all of these films always stood out to me. In Seven Brides it was the exciting barn raising dance. In Sound of Music it was the dance in the rainstorm by the gazebo. 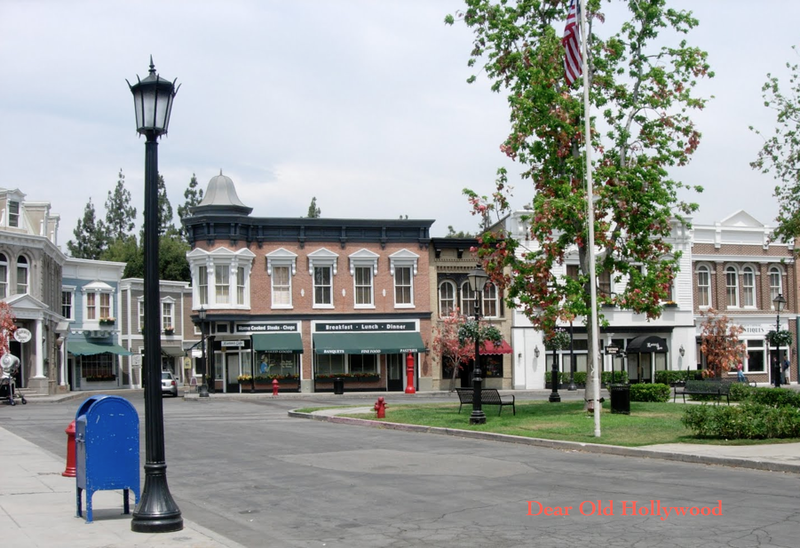 And in The Music Man it was seeing all the kids marching through town in their colorful uniforms. I later even participated (briefly) in a middle school marching band (until I ditched the school band to form a rock band which seemed like the cooler thing to do). 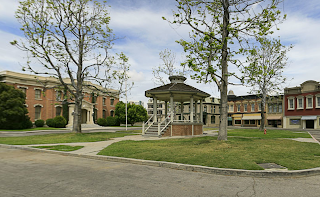 As part of the 2013 Summer Under The Stars Blogathon hosted by the blog Sittin' on a Backyard Fence, I've put together a special film locations post highlighting the colorful town of "River City, Iowa" featured in The Music Man. River City, Iowa is a fictional town based on Mason City, Iowa, the hometown of playwright Meredith Willson. 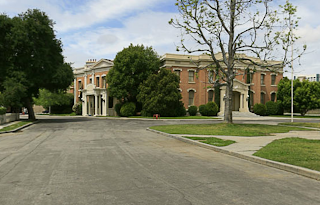 Although the story is set in the Midwest, the film was actually made at the Warner Bros. studio in Burbank, California. 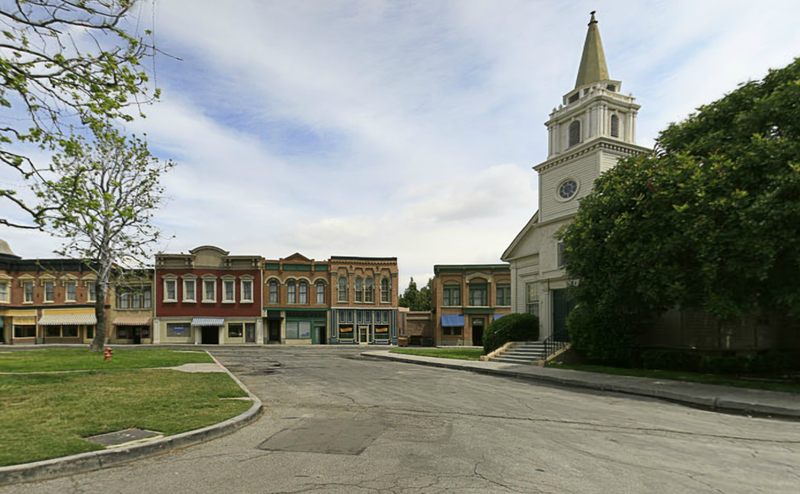 Some sets were constructed inside large sound stages, but most of the town scenes were filmed on the Midwest Street backlot which is still standing (although remodeled several times since). The back side of the chapel as seen in The Music Man. Contemporary view of the back side of the chapel. 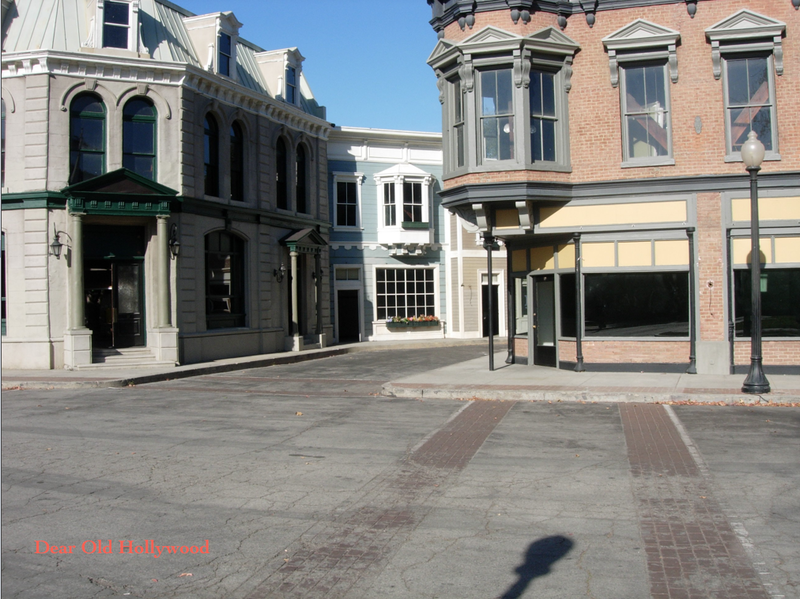 One can imagine how many films and television shows have been filmed on the Midwest Street backlot over the years. 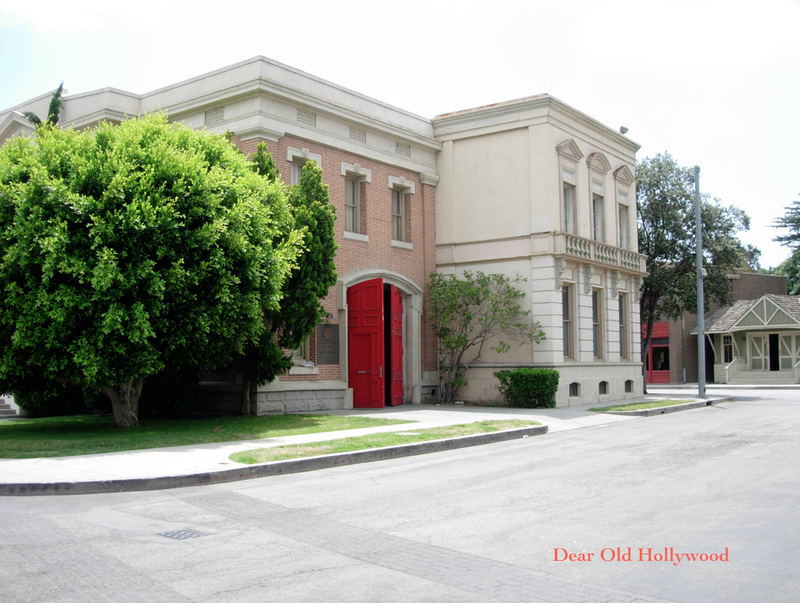 I've covered a few here on Dear Old Hollywood in the past. This same area on the back side of the chapel can also be seen in No Time For Sergeants (1958) with Andy Griffith and Suppose They Gave a War and Nobody Came? (1970) starring Tony Curtis, Brian Keith, Ernest Borgnine, Suzanne Pleshet, Tom Ewell and Don Ameche. Robert Preston passes the River City bank. The bank facade on the left. The pool hall facade on the right. Above is a comparison of the facades that are used as the River City bank building and the pool hall. Remember that scene where Preston tells the town folk, "Ya got trouble, my friend right here, I say, trouble right here in River City...Trouble with a capital 'T' and that rhymes with 'P' and that stands for pool!" Preston and Buddy Hackett sit in front of the pool hall. Looking towards the pool hall facade. Preston with the town folk in front of the River City City Hall. A contemporary view of the City Hall facade. Preston sitting with the Midwest Street chapel in the background. Looking above Midwest Street towards the chapel. Preston runs toward the livery stable. Looking towards the livery stable facade as it appears now. Some of the facades that have changed dramatically since The Music Man was made are those looking in the direction of the livery stable buildings. You can see the difference in the comparison above. Hackett and Preston sitting on a bench in the center of town. 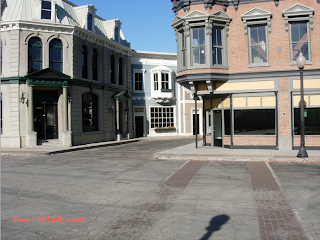 Looking across the Midwest Street courtyard. Another facade on the Midwest Street backlot that has changed is the home located on the left side of the below screenshot (where the couple are riding a bicycle). The City Hall building can still be seen on the right side of the screenshot. A view of Midwest Street seen in The Music Man. The same view of Midwest Street as it appears today. In the next comparison Preston leads the band through Midwest Street and in the background we see that the same building that houses the City Hall on one side, houses the Library on another, and later you will see also houses the Fire Station on the opposite side. Preston leads the band past the library and city hall facades. Looking towards the Library facade (left) and City Hall (right). The band marches past the Midwest Street courtyard. Although the chapel has been remodeled, it still has the same basic shape. Looking up Midwest Street as the band marches on. Looking up Midwest Street with the City Hall facade in the background. The River City Fire Department. Fire Department facade shares the same building as the City Hall. 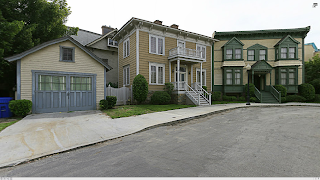 Off from the main courtyard of Midwest Street is a small residential street. The next few images show the homes on this street. Paul Ford passes a home on Midwest Street. 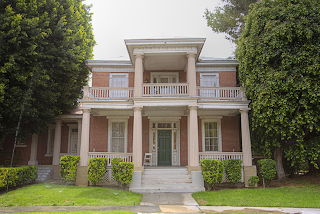 The same home as it appears today. Preston stands in front of another home on Midwest Street. Preston in front of another Midwest Street home. 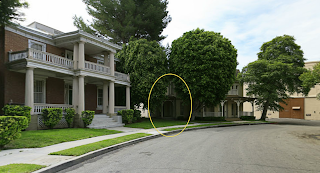 The yellow oval marks the spot where Preston is standing in the screenshot above. The marching band heads down the residential street off of Midwest Street. 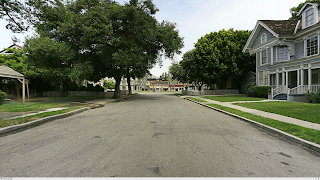 Looking from the residential street towards the center of Midwest Street. In addition to Shirley Jones and Robert Preston, The Music Man (1962) also stars Buddy Hackett, Hermione Gingold, Paul Ford, Pert Kelton, Timmy Everett, Susan Luckey, Mary Wickes and a little Ron Howard. The film is available on DVD but I recommend picking up the blu-ray release which looks amazing. 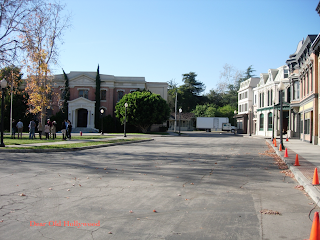 Some additional films previously covered here on Dear old Hollywood to feature the Midwest Street backlot set include The Hard Way (1943), No Time For Sergeants (1958), Suppose They Gave a War and Nobody Came? (1970), Nickelodeon (1976), The Monster Squad (1987), East of Eden (1955), and Rebel Without a Cause (1955). 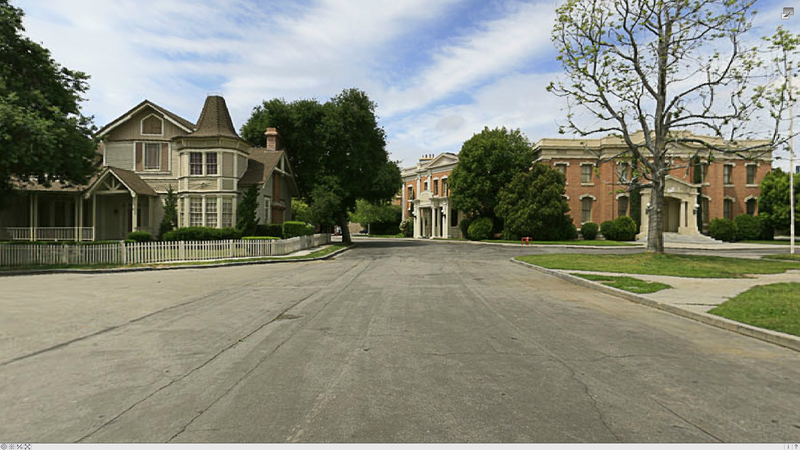 Except where noted otherwise, all images (c) Warner Bros.
Great post, Robby - your comparison shots blow me away. Excellent post!!! 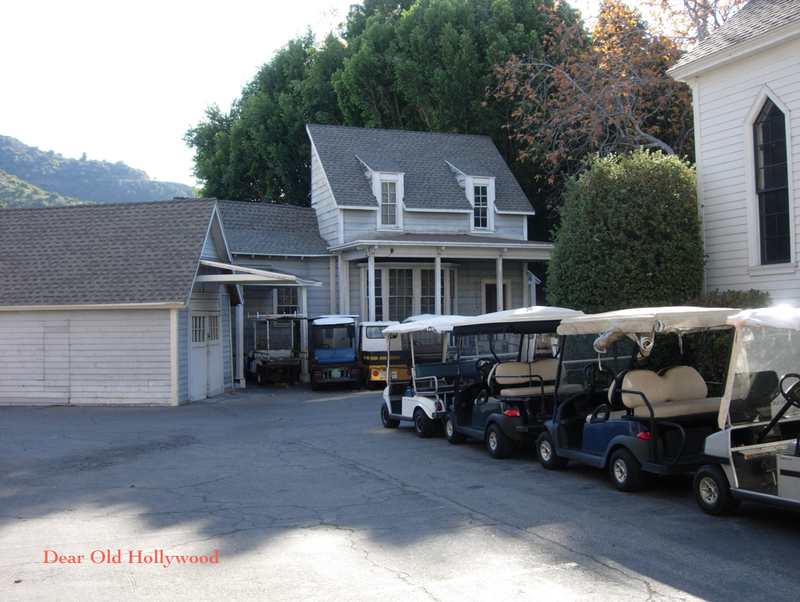 This year I had 1) seen The Music Man and 2) been to the WB lot for the very first time. So reading your post and seeing those screencaps compared with the set all made sense to me since everything is still so fresh in my mind. 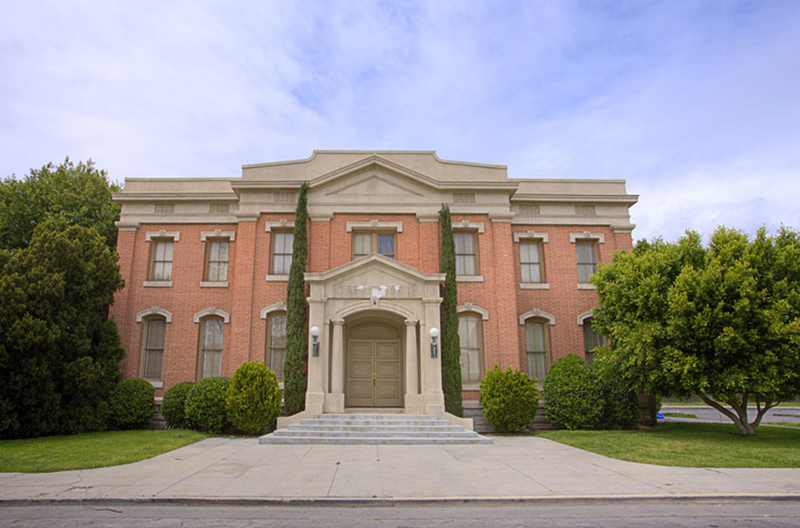 Great work and I love how you found the exact door way of the home in the movie. How perfect! Wonderful you were able to walk that area of the lot - now you can really piece it all together in your mind. 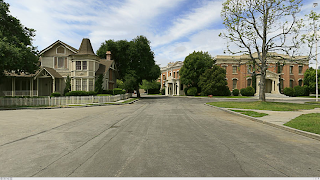 You will start recognizing that area more and more as you watch classic (and non classic) films. Great job! I watched part of "The Music Man" the other night on TCM and recognized several locations from the Warner Bros. (My husband and I took the tour last year.) It's always such a thrill to see movies filmed in places you've been, isn't it? This is fantastic! 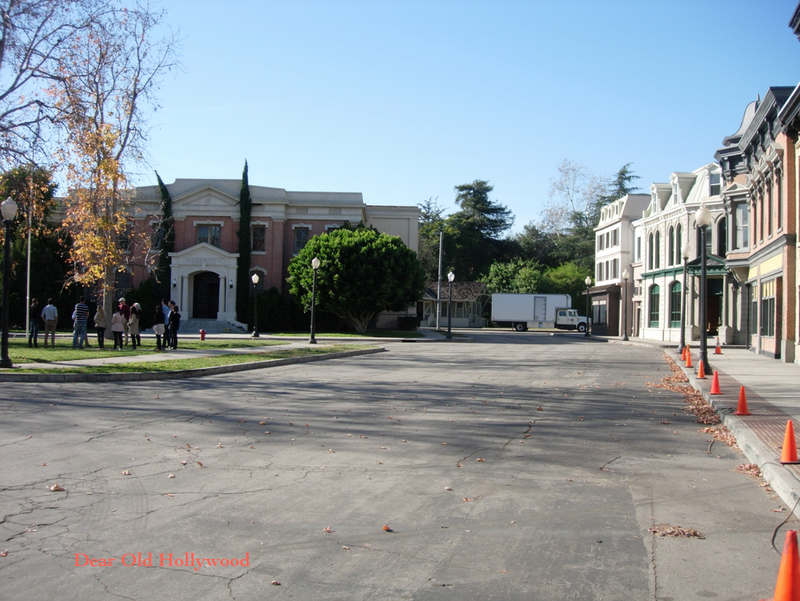 It's such a thrill to see a film location in person. Thanks for putting this together for the blogathon. I really appreciate it. Really nice blog you made. I love it! My brother just sent this to me. Great shots from on of our mother's favorite movie as well. 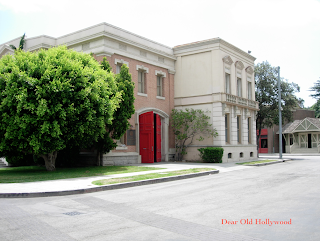 Twenty years ago, I had a 12 month temp job on the Warner Bros. 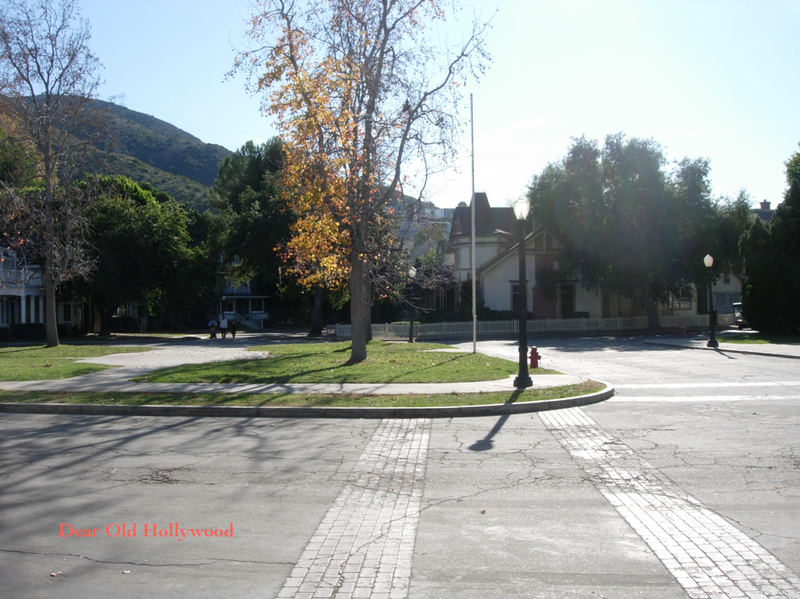 Lot, and it was so fun walking from my office to the commissary each fay for lunch or meetings, walking past these landmarks. The only thing you left out: The River City High School building was over at the Universal Studios Back Lot. 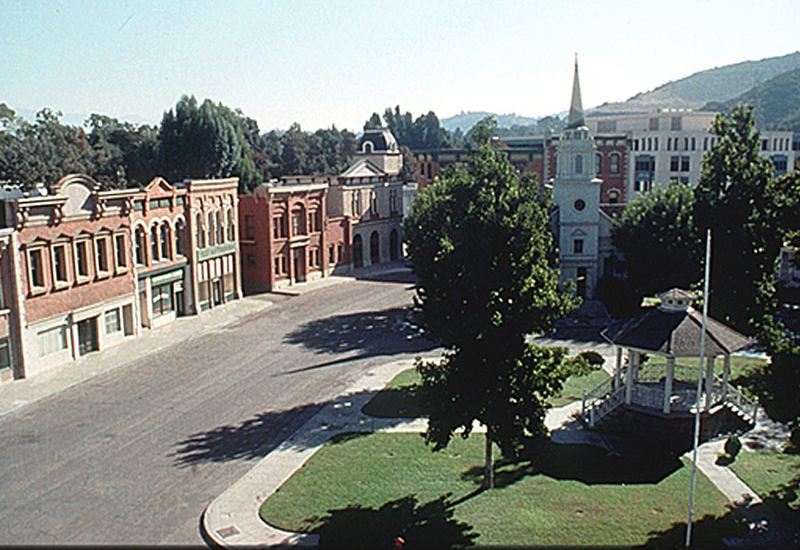 It was the same centerpiece used for the "Back to the Future" movies.